If you have made the choice to get into shape, like many people the next step for you is probably finding a gym. While some people opt for workout DVD’s or buying home equipment like a treadmill, a gym can be a lot more convenient and full of more options rather than a single DVD or treadmill. Choosing the right gym is important since you will be entering a contract. If you make the mistake of rushing into a commitment with a gym that you aren’t a good fit for then you will be bound to the agreement and basically lose all of your money. Since you will be spending a lot of time at your new gym, it is important to make sure that you choose the best possible one for your needs. 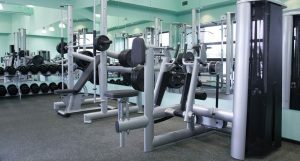 Here are some of the most important things to look for when choosing a gym. You will want to look for a gym that has a front desk staff which greets you with a smile every time you arrive. You want to be treated with the same respect as anyone else regardless of your fitness level. Some gyms hire staff that shows preference to the members who are in better shape and frequents the gym more than others. However, this isn’t how it should be. When you walk into your gym you want a smile and someone that can answer any questions that you might have. Their front desk should be well organized and informative regarding membership information. One of the biggest no-no’s when it comes to a workout facility is dirty old equipment which isn’t regularly maintenanced. The last thing you need is to get injured from using a machine which breaks while you are lifting something heavy. When shopping for gyms make sure that you see spray bottles full of cleaning solution and paper towels throughout the facility which encourage members to clean up after themselves. When you are sweating profusely on the machines it is considered proper gym courtesy to wipe your machine down following use. Look for a gym which doesn’t only offer machine use but also offers classes. Group classes are a fun way to get in some activities that you’ve never tried before and get in shape in a group setting which can be extra motivational. You will want to choose a gym which is in a convenient location from your home or work. If you choose somewhere which is a long drive away then you are less likely to be motivated to go work out. Opt for somewhere a short drive away and easy to get to.